Perhaps best known for its pungent aroma and flavor, blue cheese gets its distinct, streaked appearance from the mold used to produce it. You can serve blue cheese on its own, add it to salads or even use it as a base for dips and salad dressings. Blue cheese has a number of nutritional drawbacks, which means that it's best consumed in moderation. However, it does offer some nutritional value, and eating blue cheese boosts your vitamin and mineral intake. One of blue cheese's major drawbacks is its high calorie content. Just a single ounce of cheese contains 100 calories, or 5 percent of your daily intake in a 2,000-calorie diet. While 5 percent might not seem like much, blue cheese's small serving size means you might inadvertently consume more than one serving at once, causing you to over-consume calories. Each serving of blue cheese also contains 8.2 grams of fat, including 5.3 grams of saturated fat. This type of harmful fat negatively affects your cholesterol levels, and following a diet rich in saturated fat threatens your cardiovascular health. The saturated fat found in one ounce of blue cheese makes up almost one-quarter of the maximum amount of saturated fat allowed for a 2,000-calorie diet. Blue cheese also contains a significant amount of sodium, or salt. Your body requires some sodium to function -- it acts as an electrolyte, and plays essential roles in heart and nerve function, as well as blood pressure regulation. However, most people consume too much sodium, and as a result, increase their risk of kidney damage, some types of cancer and cardiovascular disease. Each ounce of blue cheese boosts your sodium intake by 325 milligrams, which is 22 percent of your recommended daily limit. 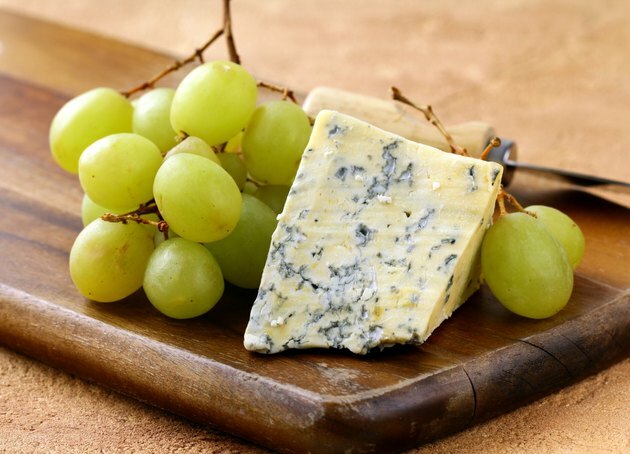 Despite its drawbacks, blue cheese offers some nutritional value, and boosts your intake of protein and vitamin B-12. A 1-ounce serving of cheese provides 6.1 grams of protein, which helps your body make hormones, maintain the health of your immune system and repair damaged tissues. The protein in blue cheese contributes slightly more than 10 percent toward the daily protein requirements for a 150-pound individual. The vitamin B-12 found in blue cheese controls gene activity in your cells, and also nourishes your nerves and red blood cells. An ounce of blue cheese offers 0.35 micrograms of vitamin B-12, or 15 percent of the recommended daily intake. Blue cheese also offers some health benefits, because it provides essential calcium and phosphorus. Your body relies on both minerals to maintain bone density; together they help form a mineral complex, called hydroxyapatite, which is abundant in your bone tissue. Phosphorus also nourishes your cell membranes and controls enzyme activity in your cells, while calcium helps control your hormone levels. Eat an ounce of blue cheese and you'll consume 150 milligrams of calcium -- 15 percent of the recommended daily intake -- along with 110 milligrams of phosphorus, or 16 percent of your daily needs.